One of our latest creations here at Amped Logic is Flanigan’s Villas. Overall, a custom design yet relatively simple. The booking system is done thru a third party, and unfortunately, we do not have any control over this design. We did take special care to customize the WordPress administration to make this site very simple for the client to edit and update their content while maintaining website styling. You can view the video here to get a glimpse of how we made this possible. We offered several color variations in design. The client ultimately chose the earthy tone of the mocha color. Beautiful pictures and scenery always makes design easier. The layout is set to compliment the perfect location, offer clear direction for booking a room or calling the owners, but most of all showcase the villas, amenities and great testimonials. The client was a pleasure to work with, had good information and feedback, and trusted us to do what we do best. 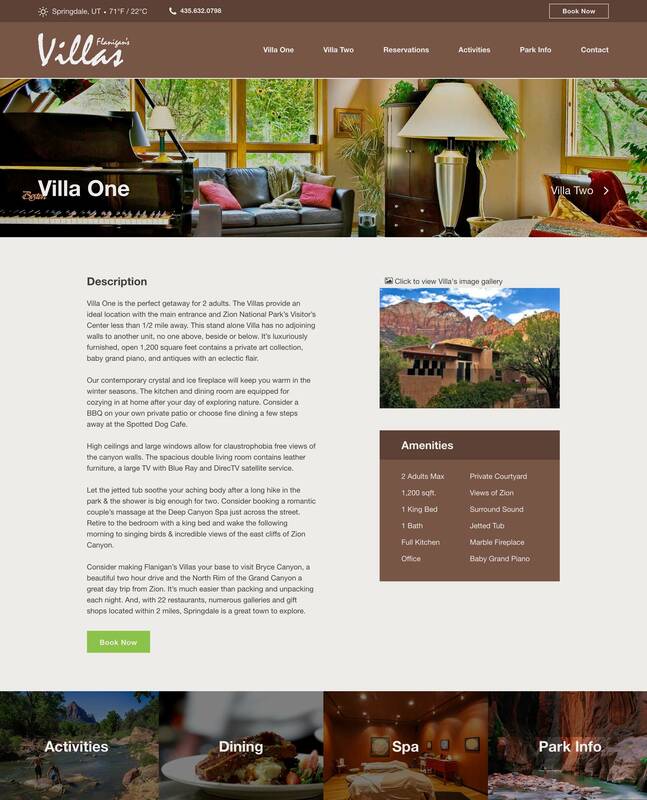 If you ever are staying in Springdale or the Zion National Park area, we highly recommend the Flanigan’s Villas for your travel accommodations.